Edinburgh city council will investigate installing “dedicated bus lanes” along the entirety of Queensferry Road to tackle congestion and air pollution in the north west of the city. The council’s transport and environment committee agreed a motion to look into the feasibility of introducing bus lanes along the A90 route from South Queensferry to the city centre in both directions. Queensferry Road is often congested at peak times, which has led to increased air pollution. Although there are some areas where bus lanes are in operation – these do not stretch along the entire route. The motion was brought forward by the SNP-Labout coalition in response to residents’ concerns over the volume of traffic through Barnton junction – as well as preparing for increased traffic due to housing developments in South Queensferry, Kirkliston and Maybury. route of the Queensferry Road” and “including an understanding of key current strategic transport projects and policy development and how they will relate to provision of bus lanes”. Transport and environment convener, Cllr Lesley Macinnes, said: “We recognise the congestion and traffic management issues along this corridor. Liberal Democrat ward Cllr Kevin Lang, who previously accused Cllr Macinnes of treating residents in west Edinburgh like “second-class citizens” has blasted the lack of solid plans to tackle the issues. 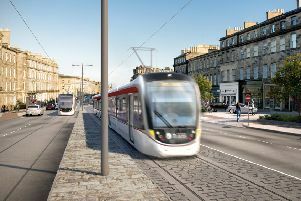 He said: “SNP and Labour councillors have been dragged kicking and screaming into caring about public transport in the north west of Edinburgh. They were happy to turn over thousands of acres of local green belt land for new housing but gave little thought to the transport issues, especially on Queensferry Road and the Barnton junction. Meanwhile, bus operators have been crying out for new priority measures to improve the reliability of their services. In April 2018, Cllr Lang called for an action plan to end a “congestion crisis” at Barnton junction – when the issue was raised at the council’s north west locality committee. The junction is often clogged up with vehicles entering and leaving the Scottish capital, as well as acting as a key junction for airport traffic and those heading towards the Forth bridges. Cllr Macinnes has hit back at Cllr’s Lang’s stance on how the SNP-Labour coalition is tackling infrastructure improvements in the west of the city. She said: “Cllr Lang completely misunderstands the processes in providing future sustainable transport options for the west of Edinburgh. “As usual, he attempts to make west Edinburgh a special case when in fact much of our work does and should sit at a strategic level.